In Nepal, the Everest and Gokyo lakes trek is one of Nepal's most famous trekking circuits , set amongst breath-taking high mountain scenery, through the Khumbu - Sherpa country. After a magnificent mountain flight to Lukla we follow the Dudh Koshi valley to Namche Bazaar. The trekking trail to Gokyo is a gradual ascent up the valley passing through patches of birch and rhododendron forest where the elusive musk deer can sometimes be seen. Through small yak-grazing settlements we reach the Gokyo lakes where we climb Gokyo Peak (5480 m) and enjoy one of the most beautiful mountain scenery of Nepal including Everest, Makalu and Cho Oyo. 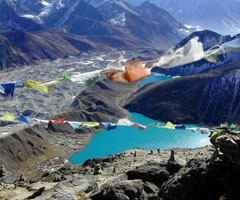 From this point there are two trekking trails to Lobuche: through Cho La or south to Phortse and on to Pheriche. After the ascent of Kala Patthar (5545 m) and the impressive up-close view of Everest, our return trekking route passes through Tengboche, a magnificent location with a fascinating monastery. We rest here and savor the incredible scenery of Nepal Himalayas , including magnificent views of Everest, Ama Dablam (6856m), Kantega (6809m), Kwangde (6194m), Nuptse (7879m), and Lhotse (8511m), to name but a few. By plane then trek to Phakding (2600 m) in 3h . Great sight of the Kusum Kangru (6369 m). Acclimatisation day which gives us time for a sightseeing tour or an excursion towards the village of Thame or Khumjung. Phortse Thanga (3600 m) in 5 h. Beautiful view of the Tengpoche monastery and the verdant Phortse plateau on east. Stunning vista of the Thamserku (6608 m) and Kang Taïga (6685 m) on south-east and the Taboche (6367 m) on north-east..
Machhermo (4410 m) in 5 h. Rhododendrons forests give way to junipers and tall conifers. After Dole the landscape gets rocky and only a few trees are left. First sights of the Cho Oyu (8153 m). in 4 h. We follow the immense frontal moraine of the Ngozumpa glacier to the Gokyo lakes. Climbing up we will discover one by one those emerald drops lost into black rocks and snow. in 5 h. A breathtaking 360 º view with Lhotse,Everest, Makalu, Cho Oyu, four of the forteen 8000 m on earth, dominating the myriad lesser peaks. in 6 h. The trail goes through the east side of the valley. in 5 h. Descent towards Imja Khola river, then climb up to Pheriche passing by Pangboche which houses the oldest monastery in the Khumbu. Ama Dablam seems almost at touching distance and shines with majesty. in 5 h. Progress along the river and carry on through moraines. Beautiful vistas of the Nuptse situated north east and on the Taboche, Chola Tse and Lobuche on the west side. in 3 h. We continue along the side of the Khumbu glacier, the path becomes rocky and awkward as we keep climbing across the moraine. The sugar loaf dome Pumori (7145 m) lies directly ahead, on the right the Nuptse rises in a sheer spire and behind it an elusive sight of the Everest. Lobuche in 7 h. An intricate route threading its way between crevasses and almost translucent ice pinnacles and undulating over moraine ridges. Unforgettable panorama from the Kala Patthar: Ama Dablam, Makalu, Nuptse, Lhotse and the impressive black pyramid of Everest. We then retrace our steps to Gorak Shep and return to Lobuche. Day 15: Lobuche- Dingboche (4410 m) in 5 h.
Day 16: Dingboche - Tengboche (3870 m) in 5h. in 6 h. numerous ascents and descents through the forest, among rocky cliffs and sheer drops overlooking the river. Day 19: Lukla - Kathmandu by plane. Day 21: Kathmandu. Hotel - airport transfer.